The Center for World Music would like to recognize Garit Imhoff for his years of dedication as an outstanding teaching artist in residence for the World Music in the Schools program. 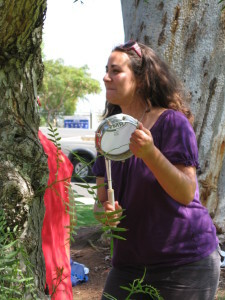 Garit Imhoff is a professional mbira player, teacher, and all-around performer, specializing in storytelling and movement. He is a graduate of the California Institute of the Arts and has participated in world music ensembles for over forty-five years. He has studied and performed traditional Zimbabwean music extensively, both in the United States and in Zimbabwe, and has studied the traditional music, puppetry, and cultures of Java and Bali in Indonesia. Mr. Imhoff learned and practiced Zimbabwean music under the tutelage of many great teachers including Ephat Mujuru, Jacob Mafuleni, Stella Chiweshe, Tute Chigamba, Irene Chigamba, and Musekiwa Chingodza. 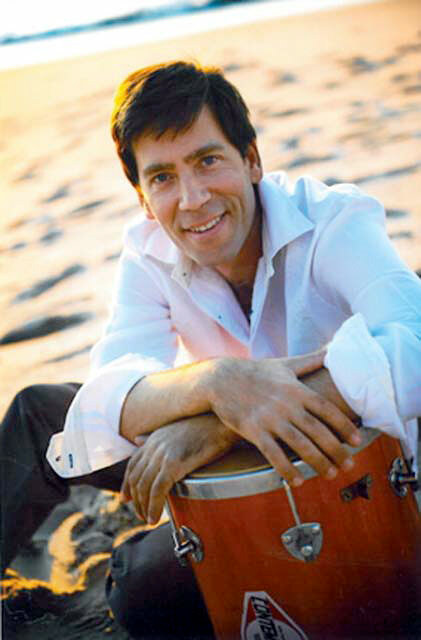 As one of its cofounders, Mr. Imhoff is an active performing member of Zimbeat, a professional San Diego-based music ensemble that specializes in the traditional and popular music of Zimbabwe. 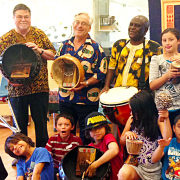 He is also a performing member of Kembang Sunda, a San Diego-based traditional west Javanese gamelan orchestra. In 2013 Mr. Imhoff was awarded a grant through the Artist Outreach Project of the Kenneth A. Picerne Foundation–funding to support teaching children in Encinitas at the Boys & Girls Club of San Dieguito. 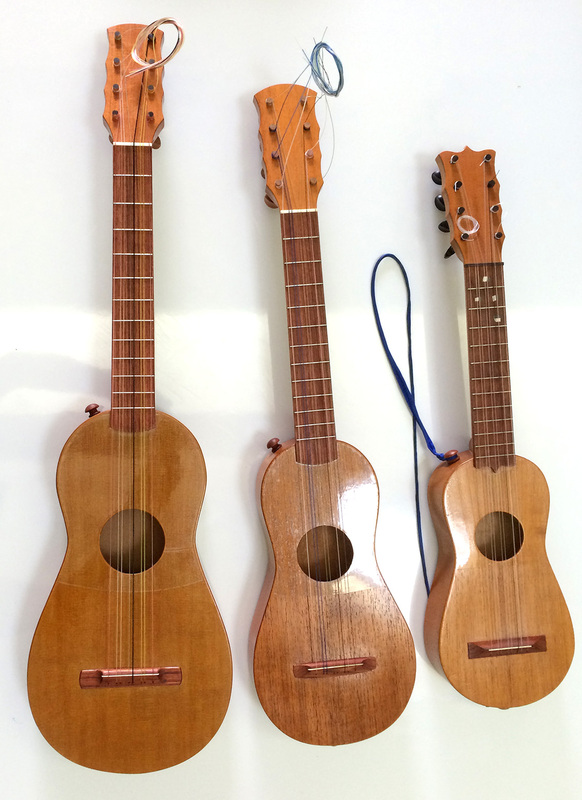 The Center for World Music partnered with the Picerne Foundation and Ticha Muzavazi, instrument builders and teacher of students with disabilities in Zimbabwe, to develop specially made small-sized Zimbabwean mbiras that could be easily played by young children. 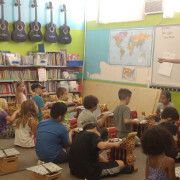 The resulting year-long project subsequently developed into Center for World Music classes in public and private primary schools throughout the County of San Diego. Combining storytelling, dance, and singing to engage his students, Mr. Imhoff has been using the small-sized mbiras to instruct San Diego K-12 children in the compelling traditions of Zimbabwe. 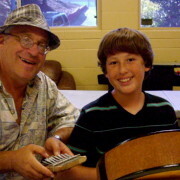 His music classes in the schools are supported by grants from the California Arts Council, the National Endowment of the Arts, and the local San Diego community. Congratulations to Stefanie Schmitz, Teaching Artist for the World Music in the Schools program, for winning a grant from Rising Arts Leaders to attend the Teaching Artist Institute. Multi-instrumentalist musical artist and teacher Stefanie Schmitz has been exploring the San Diego music scene since 2001. Her talents span an eclectic range of genres including jazz, classical, samba, choro, funk, musical theatre, playing the clarinet, tenor saxophone, Brazilian percussion, and more. Stefanie attended the University of California San Diego where she received bachelor’s degrees in Music Performance and in French Language Studies. She directs and performs with a number of San Diego-based music groups, including Choro Sotaque, Super Sonic Samba School, the Zicas, and Restoration One. 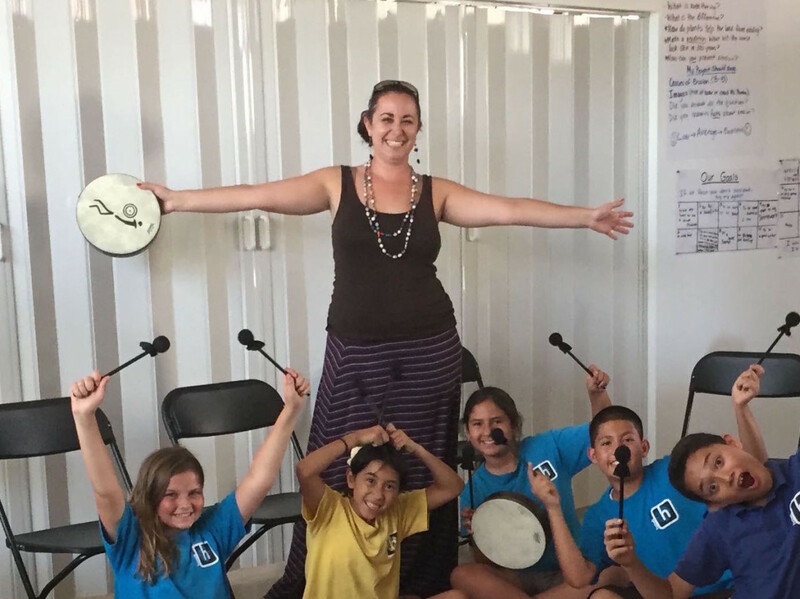 She shares the same knowledge and enthusiasm she exhibits as a band leader with her students, teaching private and group lessons on clarinet, saxophone, and percussion to students over a range of ages and ability levels. 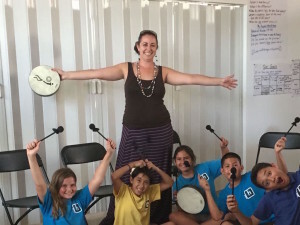 As a teaching artist for the Center for World Music, she also works in school classrooms, sharing her passion for Brazilian rhythm with San Diego area K–12 students. Under the sponsorship of the Center for World Music, Stefanie was selected in November 2015 to participate in the Teaching Artist Institute, a professional development program offered by Arts for Learning, an affiliate of Young Audiences/Arts for Learning. For a working musician who collaborates with schools as a teaching artist, this program is of tremendous value. Stefanie was awarded a matching grant from San Diego Rising Arts Leaders to support her participation in the Teaching Artist Institute. 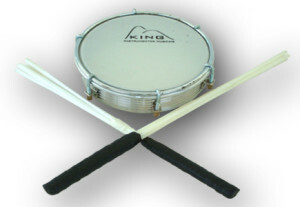 Stefanie’s love affair with Brazilian music began when she took a samba drumming class. 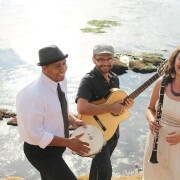 She started San Diego’s first choro group Choro Sotaque in 2009, performing traditional Brazilian folk music on clarinet. The group recorded its debut CD in 2015, which is available for purchase at chorosotaque.bandcamp.com. Stefanie has also performed with and led the community based Brazilian drum and dance group Super Sonic Samba School — a group which performs regularly for festivals and events around San Diego. 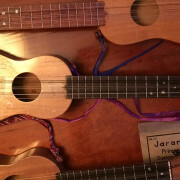 Stefanie seeks out her yearly fix of new inspiration at California Brazil Camp — a weeklong music and dance camp in the redwoods of Sonoma County. 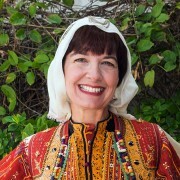 In 2013 she left her staff position at UC San Diego to embark on a six-month musical odyssey to Brazil, where she absorbed Brazilian language and culture, and studied with masters of samba and choro in Rio de Janeiro, São Paulo, Olinda, and Jericoacoara. As an associate artist for Lamb’s Players Theatre, Stefanie has played in the orchestras for several musicals, most recently in West Side Story. She also plays saxophone for the eclectic funk/rock/reggae band Restoration One, which was nominated for a 2014 San Diego Music Award. 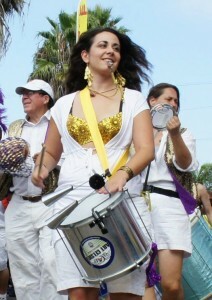 Most recently, she can be seen playing and singing with the Zicas, a new Brazilian music project. When Stefanie is not playing music or teaching, you will find her making art, tap dancing, practicing yoga, or singing in her car. She blogs about her musical adventures at Everything Is Music, stefanieschmitz.blogspot.com, and she sells her original handmade jewelry in San Diego coffee shops and on Etsy. Check out Stefanie’s website at www.stefanieschmitz.net for her upcoming performance schedule or to sign up for her mailing list. 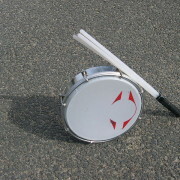 Read Stefanie’s articles on the agogô and tamborim. 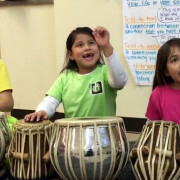 Our friends at the Stephen W. Hawking Charter School have just posted a nice video showing their World Music in the Schools students engaged in the rhythms of North Indian tabla. 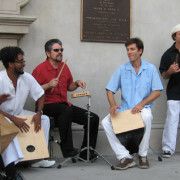 Under the direction of Miles Shrewsbery, tabla master and CWM teaching artist, they seem to be having quite a bit of fun. 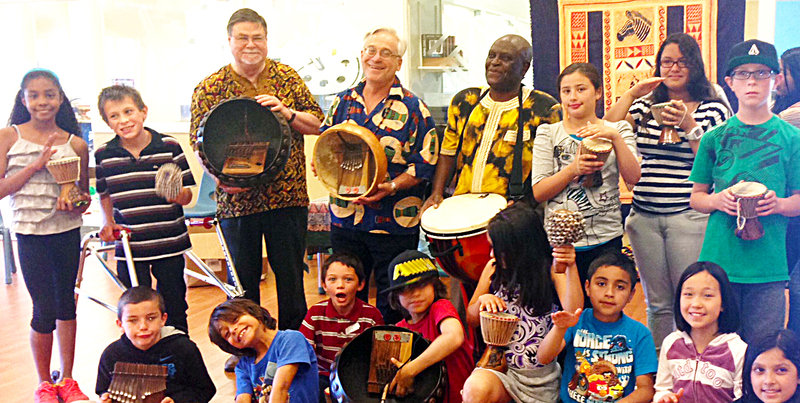 The World Music in the Schools tabla program has been going strong at the Hawking Charter School since August 2013. Rhythm, which is the sound of life, has been largely replaced by electrical pulses, produced by a machine programmed to repeat itself ad infinitum, and to thrust its booming bass notes into the very bones of the victim. Whole areas of civic space in our society are now policed by this sound, which drives anybody with the slightest feeling for music to distraction. . . . The banal melodies and mechanical rhythms, the stock harmonies recycled in song after song, these things signify the eclipse of the musical ear. 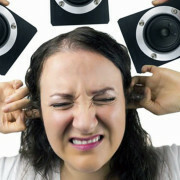 The addictive ear, dulled by repetition, is shut tight as a clam around its pointless treasures. 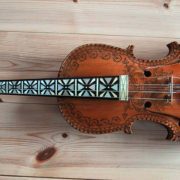 But you can prise it open with musical instruments. Put a young person in a position to make music and not just to hear it and immediately the ear begins to recover from its lethargy. 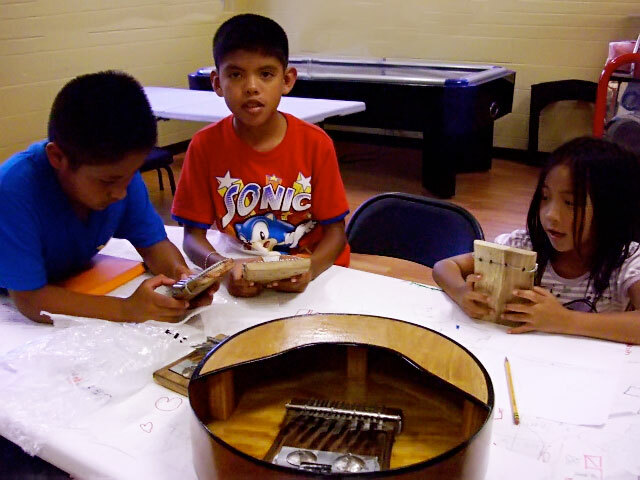 By teaching children to play musical instruments, we acquaint them with the roots of music in human life. The Center for World Music would like to give a warm welcome to Andrea Hernandez, who has recently joined our World Music in the Schools roster of teaching artists in residence. Andrea’s vibrant creativity comes from growing up in a large family of singers, musicians, dancers, writers, and artists. Her imaginative home life inspired her to actively pursue all of these arts from a very young age. She grew up drawing, painting, writing, singing, dancing, and playing every instrument she could get her hands on. She has performed Balet Folclórico (traditional dance of all regions of Mexico) since she could first walk, and continues to do so to this day. Her insatiable curiosity and appetite to learn has persisted, as she continues to study many different arts including guitar, piano, drums, flamenco, and capoeira. When she first heard the Indonesian gamelan, she was naturally drawn to it because of its complex musical rhythms. Andrea was introduced to gamelan while working at the Museum School in 2003 and has been in love with it ever since. She has studied and performed with many teachers including Dr. Alex Khalil, Putu Hiranmayena, Tyler Yamin, Djoko Walujo, and Made Lasmawan. Her primary focus has been Balinese gamelan angklung, but she has also studied Javanese gamelan, gender, and Indonesian dance under Wuri Wimboprasetyo. 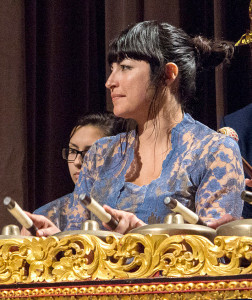 Andrea is a member of the USD Gamelan Ensemble, Gunung Mas, and performs with them on a regular basis. At USD, her enthusiasm for learning and playing is almost unmatched and her participation is very much appreciated. She has taught beginning and intermediate gamelan angklung at the Museum School for about 10 years. Andrea is determined to continue developing her abilities and teaching skills so she can help her students find the inspiration to be creative in their daily lives.